Once again, the Anarchs prove themselves to be the masters of AI breakers. With the notable exception of Atman in green and the neutral Overmind, all the best AI breakers are orange (Knight, Darwin, Eater). 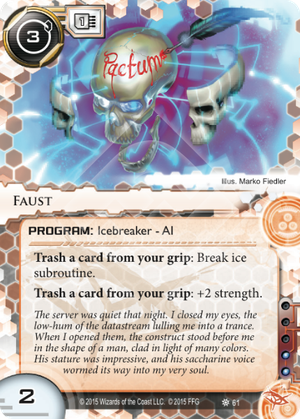 Faust changes the cost basis of breaking ice from credits, to cards. What does this mean, though? First, you have to consider a certain metric: how many clicks you need to spend gathering resources in order to break a piece of ice. For example: suppose a Shaper has out Magnum Opus and Snowball, and wants to make a run on a Bastion-protected server. Snowball breaks Bastion for 4, and with a Mopus it costs them 2 to earn the money to make that run. Faust, in comparison, would require you to trash two cards from hand, which would take you the same 2 to replace with a standard draw. That's a favorable comparison, but here's a different one: Mimic breaking Tsurugi will cost 4, and any economy will get you that in less time than it takes to draw the 4 cards Faust needs. There's another difference between credits and cards: the amount you can hold at once. There's no limit to how many credits you can have, which means that if you have the right breakers and a strong economy there's no risk of being locked out. But if the corp can set up a server that Faust needs 6 or more cards to break, it's going to be exceedingly difficult to both get in and keep your hand outside of easy Punitive Counterstrike or Neural EMP range. Lastly, there is no maximum number of credits you can spend in a game; credits are pulled from an infinite bank. But cards are pulled from a finite stack, and if a game goes long (looking at you, EtF and RP) you might find yourself burning out. That's easily fixed with Levy AR Lab Access, but three influence per copy can start to add up fast. So lets say you want to make Faust work. That means you need do a few things: increase draw speed, reduce cards needed, increase grip size, and still save some influence for LARLA. Partying at either Duggar's or Wyldside (especially with Pancakes) makes it easier to sell your soul, but if you're feeling classy, you could also spend some Quality Time at Earthrise Hotel. In a pinch, you could always just Inject or just shrug it off. (Note that trashing cards to Faust is not net or meat damage, so IHW does not activate). Using Vigil or Astrolabe can pay out lots of cards over a game. MaxX gets a free draw per turn, but the combined self-milling effects of Faust and her ability puts a lot of pressure on your LARLAs. You could also reduce your breakage costs with e3 Feedback Implants--the aforementioned Tsurugi is now 1 card + 3. Similarly, using Net-Ready Eyes or The Personal Touch can reduce the strength-boosting aspect. Quetzal, especially with e3 Feedback Implants, can help you out with those high-strength barriers (and the ever-irritating Wraparound). If you aren't using many other programs, getting out triple Origami is a good way to get your hand size up so you can stock up for runs on big scoring remotes. Otherwise, your options are basically Public Sympathy, Brain Cage, Beach Pancakes, or the high-influence Theophilius Bagbiter. Faust is a fascinating new AI that can be an effective primary breaker, but only with a deck designed to support it. Go forth and sell your soul, one card at a time. “Faust and the adjective Faustian imply a situation in which an ambitious person surrenders moral integrity in order to achieve power and success for a delimited term.” Fits the card pretty nicely. Apparently Faust himself was a bored German (well, Württemberg-er, probably at the time) who decided to scale the heights of the “All Time Worst Ideas’ list by inking a pactum (promise) in blood with the devil’s bagman, Mephistopheles (later a successful shoe salesman, also in Germany) for 24 years of earthly knowledge & pleasure. So… basically, Bedazzled with less Hurley and more pork knuckle. Strangely, at some point Faust gave financial backing to Gutenberg, although it appears that in the world of Android he decided he really needed to know Faust's home address rather than develop something useful, like a printing press. After playing Faust something struck me firstly how surprisingly good using cards as econ actually is for ICE breaking and what it actually dose to your deck. You see in away Faust turns all the cards in your deck into econ cards for lets say about 1-2 credits depending on what your doing using it for but unlike Infiltration you don't need to play the card you just throw it, you also choose the cards so useless card go first and useful cards get played meaning theirs now no redundancy in your deck since they get thrown to get into servers. This all means your actual money is still free for things like trashing cards, paying trace's or anything else that requires money. Faust is also obviously an alternative to Eater all this made me think about Edward Kim: Humanity's Hammer first. As Eater don't cut it in Ed's deck because you can't access which ruins your ability. Your also gonna want cards which Anarch lends it's self nicely to and even free of clicks with cards like Vigil & the Wyldside combo. Your also gonna want to e3 Feedback Implants to save on card trashing since breaking subs is the worst way to burn your cards which lends you into D4v1d / Knight and to consider Quetzal: Free Spirit i certainly think she can use this AI just as well as Edward Kim: Humanity's Hammer. I am unsure how useful this card will be out of faction tho, i can see Exile: Streethawk maybe making some use out of it but the only real problem with this card is you need to build around it. Your deck needs to be able to mass draw and have plenty of useless cards to happily throw away. All in all a very powerful cornerstone of a deck and something to build around otherwise tho don't both. Faust is among the most popular icebreakers in the meta. With multiple draw sources for Anarch like Wyldside, Inject, Obelus (with multi-access) and the Anarch recursion capabilities, Faust has many strengths and few weaknesses. Additionally complimentary breakers like the equally popular Paperclip can be installed directly from the heap after having been pitched. And while more "AI hate" ICE are being printed (e.g. IP Block, Chiyashi), none of them are yet as popular as Swordsman once was. Faust is likely to extend its run as one of the most common breakers in the game.